I don't think the move itself is supposed to be unsavory although it's meant to be the last cold move of a tragedy. This is however the moment when Hashirama gave up on his young self in order to protect his dream, this is supposed to be what will differentiate him from Naruto who will somehow be able to reach the next step. yea it's like this. it's not about the move itself. it's about hashirama killing madara. or at least believing that he did. naruto would never and will never kill sasuke and that is exactly the difference and what makes naruto the true hero of the story. he will never give up on his childhood ideals like hashirama did. Madara didn't die. He just didn't. I don't know how he survived, but people can't just magically come back to life after dieing. A lot of crazy stuff happens in Naruto, but that's not one of them. You said you would prefer him to show madara it was a wood clone then charge at him head on? That would be completely retarded. Why bother with the clone in the first place if you're going to do that? You seem upset hashi beat him with his mind rather then his power, i personally don't have a problem with it. Hashi already proved himself to be superior to madara in every way, before this flashback hashi and madara and senju and uchiha were considered equals. But now it's been made clear hashirama and the senju were the only number 1, and the uchiha were number 2. As far as the sword through the back, i think that is being used to signify the difference between hashi and naruto. In order to protect his dream hashi will be ruthless and let no one threaten, and naruto is more idealistic and uses talk no jutsu. It's interesting that when Kishi had Naruto say he'll surpass the previous hokages, he didn't mean just in power, but in thinking to. Hashirama was in the same position Naruto will be. Remember when Itachi asked Naruto what he'll do when/if Sasuke attacks village. Will he kill him to protect the village or let him do it. Naruto himself told Sasuke that he'll find the third options. And option Hashirama never found, since he killed Madara. This is where Naruto will surpass Hashirama, he'll do what Hashirama was unable to do. Could it be possible that Kishi never intended for Naruto to surpass previous hokages in power. And that when he had Naruto say, he'll surpass them was just in thinking, and not in actual power? I think this would be an interesting twist. People saying what Hasirama did was cowardly, but actually it wasn't. That is what true ninja do, deception is their weapon. That move reminded me about Zabuza, and how a true ninja should act. It's certainly more ninja way, then having monster fights. You and I have different definitions of death. I consider death to be a state where you can't think anymore, not even within your deepest subconscious. Even if it only was the faintest bit, Jiraiya was still alive enough to have some thoughts, and to get so thoroughly enraged by them that he could open his eyes and move again. The betrayal you can see is trivial. What is truly fearsome, is the betrayal you don't see. The mere fact that Jiraiya had enough presence of mind to 'will it' means he wasn't nearly dead. "Pain has control over life and death" is something he proclaimed to himself. He's not actually a God who controls life and death. What's more reasonable, this whole vague soul theory or Pain simply making a mistake? He does make them, you know. This is a response to the original statement that "dead don't come back to life in Naruto". I meant BY THEMSELVES. Have you ever seen anyone in Naruto come back to life by themselves? No, because it's not possible. There are currently only three ways: Edo Tensei, which doesn't bring you back to life, but reincarnates your soul into a sacrifice. Chiyo's forbidden reanimation jutsu, which takes the user's life. And Rinne Tensei, which also takes he user's life. So no coming back to life is not that common, especially without any sort of technique or assistance. I'm sure Rinne Tensei does not automatically take the user's life. Nagato was exhausted and had to revive a huge number of people, completely depleting his stamina, that's why he died (death from exhaustion, it happens irl as well). 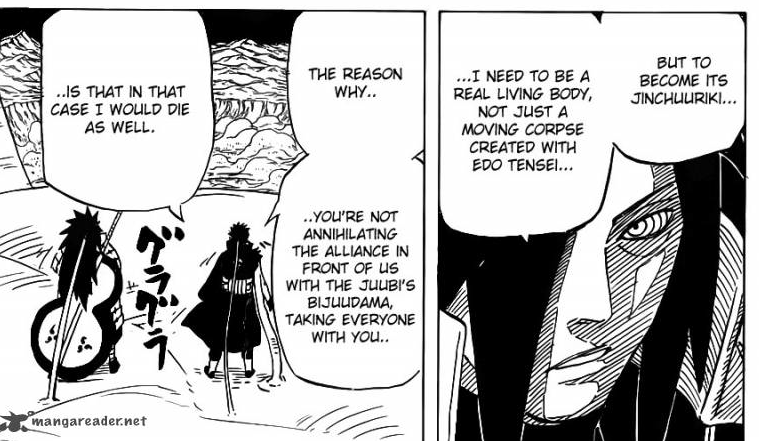 Obito outright stated that Madara eventually needed him to use the technique, as an Edo Tensei body can't become a jinchuuriki, and Madara intends to become the jinchuuriki of the Jyuubi. Obito said he will die if he uses the technique. What does it matter how they come back to life? If someone is dead they should stay dead. Death has been cheapened enough in Naruto. I'm still dreading the fact that Obito will go all Pain on us and bring everyone back to life with his rinnegan. Or he might use it on Madara after all and the world will be fighting a Jyuubi jinchuuriki Madara. You don't know how far the story is going to go. And I really don't see Obito redeeming himself now, even though it seems like something Kishi would do. So... The chapter this week was nice finally we end the flashback and go back to action. I Been looking around on the web it seem as if the edo madara vs edo hashi topic is coming back, two things just pass my mind. One, being Edo doesn't seem to be an advantage to madara instead he seems frustrated that it was the method to get him back to life. Second, would the senju cells he carries interact if hashi is around I mean when naruto used natural chakra they turn into trees would they same happen to madara's body? The only reason Madara is frustrated about the Edo is because he can't become the Jyuubi's jinchuuriki like this. However that doesn't make him less dangerous to the good guys. He still can't die, and since the Edo has been released already he's not gonna go away either. And no I don't think Hashirama's cells will turn against him. Anybody think Izuna is still gonna be revived sometime soon? I gave it a good chance a few chapters ago, but now it's about 0% chance. The story that Itachi said was a lie, Izuna died as a kid in a battle, he had no important part in the main plot of the flashback. If he came back as a kid he would have no connection to the story, also a kid can't even understand what's going on. And on top of that the battlefield will be already very overcrowded when the 4 kages and Sasuke's team join the war, no need for anyone else there. With all those people there i will really praise Kishimoto if he can arrange things in a way where every character gets a bit of spotlight but that does not break the flow of the story. Last chapter Hashirama was prepared to kill himself to make peace with the Uchiha. He also couldn't answer Madara's question about who he would kill to preserve the peace of the village. This chapter however he said he would be prepared to sacrifice anyone, even family, if it meant keeping the village safe. Why the sudden 180? What happened during the time that Madara left and their last fight, for him to change his views? I think the story made it pretty obvious that they had to face the harsh reality of the world that doesn't allow their original dream to become true as they imagined it when they were kids. That's what growing up means. But they have a very different personality, so they gave a very different answer. Madara is sticking 100% to his dream, no compromises, he just chose to disregard the laws of the world, to create his own laws inside a fake world that's called infinite tsukiyomi. We usually say that only crazy people disregard reality, to live in their dream world Hashirama chose to adapt his dream to the reality of the world, even if it meant the degradation of the orignial idea, but even then it remained a great advancement towards a better world that came true. It doesn't and it does, Kishimoto often creates such tricky rules for a jutsu that it will suit the story: Nagato said that if the people died only recently then he can resurrect them all, and it only costs him a lot of chakra, the reason why Konan was very worried was that Nagato didn't have a lot of chakra after he fought against a whole village and Naruto and the frogs, so Nagato willingly chose to die because he felt that he had no other purpose in life at that point. But to resurrect someone who died a long ago, like Madara, he needs to give up his life. This latter part of the rule makes sure that Nagato or anyone with the rinnegan can't just resurrect anyone he wants and break the whole plot with that. The rule can be a hint that those who died in these 2 days (amost the whole army of 80,000 ninja) of the war will be resurrected in the end. Another hint in my opinion is that Kishimoto never really emphasized the insane amount of deaths in just 2 days, not even the attack on konoha was so bloody and ruthless. Last edited by Ero-Senn1n; 2013-04-05 at 11:33. Then tell me what the definition is of "controlling life and death". He can't kill people with the bat of an eye, and according to my friend's theory above he can only resurrect those who recently died, otherwise it costs him his own life. Pain is the one who called himself a God. That statement is about worth as much as saying he can control life and death, which is not much. I don't see the 4 Hokages ever joining the war. You couldn't avoid it being overkill and having them overshadow everyone. Remember, 4 current Kage will be showing up soon and the Alliance was taking it to Madara, Obito, and the Juubi the last we saw them. There is no room at the inn even when Madara makes a comeback and the juubi enters its final form. If Kishi has Hashirama and Madara engage in a boring fanservice zombie fight, he risks turning the manga into "The Legend of Hashirama Senju and Madara Uchiha" as it nears its end rather than "Naruto Uzumaki and his ninja pals save the world." He takes away from the main character and his conflict. Never mind what you do with an immortal Minato, Tobirama, and Hiruzen. Pure overkill. That is why the Hokages and Hashirama's role should end when Sasuke decides his fate and leaves for the battlefield. I am sure Kishi has a way to bring their closure. The fight is about the living ninja world uniting to fight evil and returning the past to the past so they can build a brighter future. The Hokages represent part of that failed past and have no place in this fight. They have to leave it to the current generation. That is the whole theme of Naruto. I agree with all you've said, but I can't see Tobirama going "Well if that's all you wanted to know, have fun with the war and we'll be going back to hell now". He already wanted to join the war as soon as he heard about it, right now he's only waiting until the talking is done.